blogging | Little miss obsessive's anatomy!! I’m so glad I’m out of the zombie zone I was in, yesterday. Has happened before too and it always leaves me wondering how powerful a mind is, if it decides to shut down there is nothing you can do about it. Lately, Gotham is going super busy which leaves me all exhausted by the end of the day which kind of is keeping me from blogging and from my latest resolution. I have decided to work on Jane Doe again, sort of re-work. I want to do changes, major ones to send it again and hopefully this time it would be more presentable. I can’t work on Dominique, Crossroads, New York and the other untitled story I have in my laptop knowing I failed with Jane Doe. Knowing that I could still try to work on it, fix it, re-brush it and send it again. I keep thinking about how writing was my one true love; something I used to love doing no matter how crazy things have had been but now its one thing I can’t do. I don’t know if its the rejection of Jane Doe or the fact that my stories are not what people would like to read. I only write about scarred souls, people with tragedy and revenge and death is often there. I like to write tragedy and I know I’m not a good writer, heck I’m not even a story teller. But I like to write. So, here I’m doing one thing that I like, write. I have decided to get back to Jane Doe, cause I want to believe trying one more time is what I need. I might never get any of my work published but I don’t want to say I never tried. I don’t have much regrets in life, trust me. I mean my life is one hell of a drama but I have never done anything to regret except one or two stupid things. Not writing because I won’t make it would be a regret I don’t want in my resume of life. 4 years of infidelity with my diaries…Happy birthday to my blog!!!! I need a “Don’t talk to me, unless you have an eatable to offer” t-shirt today. I’m having a work loaded week and today almost killed me. I know I say I like busy days at Gotham but now it’s getting bad. Anyhow, before I continue writing let me tell you why I wasn’t blogging, I’ve become addicted to “Lost” just can’t stop watching it. I’m so angry right now, not on anyone in particular but on myself maybe. Life isn’t fair, I get that but why can’t i just find something better than Gotham. I guess it’s one of those days when everything in my body wants to quit from Gotham but then I will sleep on it, wake up, drive to work, have my cup of coffee looking at the screen only to realise I cant break the shackles of my comfort zone. Because, I already have a battle inside my head about things bigger than a boring job. Good thing about the day, my sweet little blog has just turned 4. Yay! Happy birthday to Little Miss Obsessive’s Anatomy. Four frekin years is bloody awesome and quite decent if you think about the fact that I’m a quitter. I love my blog because it’s the only place I get to be a free-will writer with no boss, no deadlines, no stupid same thing all day, no nothing. I have found friends here, friends with their own world of stories, friends who listen to my cribbing and still come back. I have found a place to talk, talk about anything, everything. This is one place where I can say its hurting and its hurting bad, because I don’t say that in my world, to people around. I’m exhausted, so can’t do much “YAY” today but maybe tomorrow. Thank you for being a part of my little blog journey, a place I can say I’m not a happy person and not a great writer, but I smile and write anyway. Yesterday i played 5 games of Chess and i won every single game but i wonder why cant i do same when im playing at the yearly Chess Tournament at Gotham. While it was a good day for me, it wasn’t for my buddy Federer. Anyways, who cares about final now. Victory or no victory i’m always Team Federer…!!!! Before i go babbling, this is my 600th post and so i want to say YAY…!!!!!!!!! Crazy right? I think blogging and music have become my drug cant do without them. 6oo posts is super crazy and wow considering the fact that im not even a serious, funny, political, or freshly post material. Im just a messed up person who was once a diary writer and is now a serial blogger. Hey, i have also added a new page to my blog Poet inside Little’s Head. This one has all the so called poems that i have written so far in my blog. I just compiled them in one place because i have been meaning to do that for so long now. Im not a poet but sometimes i end up scribbling words in a manner which could, from a very far angle, resemble to something like a poem. 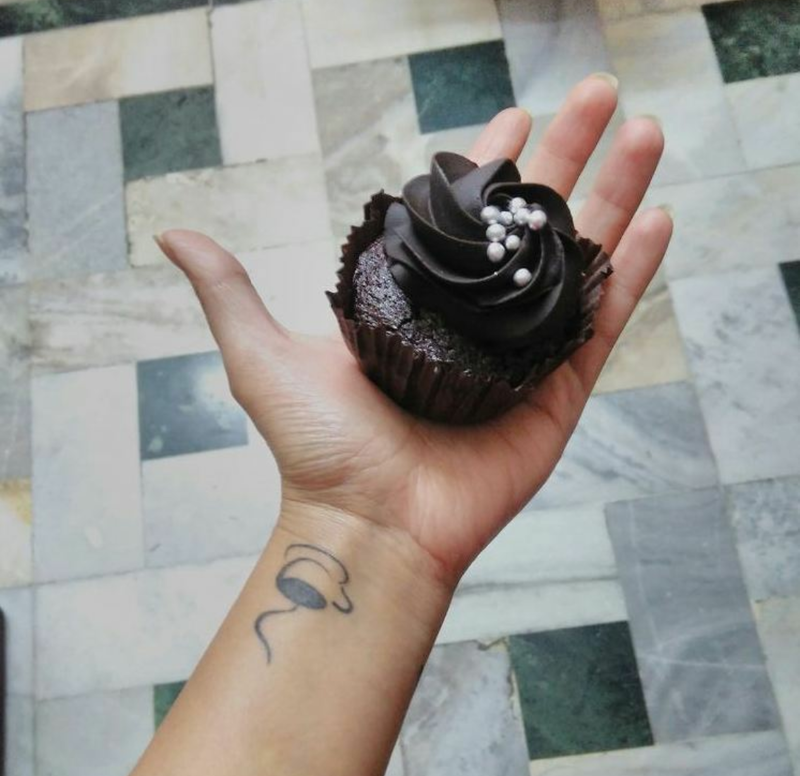 Thankyou for being a part of my blog journey…Little doesn’t blog she blabbers but she likes doing it. Little wants to go back to being little…!!!! Today I started with a new book and I have decided to read a little, everyday. Too much of TV shows are keeping me away from reading and writing. Fact is I indulge in marathon fictional shows to stay busy and away from my inner turbulence. But now its time for me to give time to other things too. Thankyou Internet God for my internet service are down just when I needed a push towards reading. I also need to, now, get back to my daily workout. Cause I cant let myself be like this. Unfortunately for people like me who cant cry out loud, both the patient and shrink live in same body. Self destruction and self help go hand in hand in my case. I have few pictures on my wardrobe. Pictures of family, friends, snowy and few from my childhood. In one picture I see a small very small girl wearing her father’s army cap and smiling while giving a salute to whoever was taking the picture. Everytime I look at that picture of mine, I wonder if I was happy back then. Truly happy. If I ever knew how life was going to turn out. I look happy and safe from future. I want to go back to being her, the little girl in that photograph. But fact is I cant go back being a little girl anymore, the girl who knew nothing about world and its strange ways. So I just try to be a self proclaimed super hero who has secrets, who has a battle and who is loved by everyone because noone knows that the face behind the mask is another average person made of flesh and hone. Weird I wasnt suppose to write an emotional blog just an update on my plans about focusing on reading. I’m highly disappointed with the finale of Dexter’s last season. Before i go on talking about what the hell happened let me answer a simple question “why i was avoiding blogging for past few days?”… Answer is simple – I don’t know. Now that you know that i don’t know lets go back to Dexter. Its juts crazy how you have this very brilliant, out of ordinary and out of box concept of a serial killer who kills only bad guys, who is struggling to be normal around family and friends who adore him for he is nothing but a sweet geeky guy who loves bowling and boating. And then, you just screw it all in the end. Past few days i have been busy doing nothing but watching back to back episodes of The Killing because im obsessed with it. Let’s be honest im scared now, what will be the finale of The Killing, Pretty Little Liars, Grey’s Anatomy, Castle and Vampire Diaries. Dexter broke my heart into a million pieces and in ways that i am scared about same happening by other shows. I thought it’s just me, then my brother said the same thing and then i checked internet and saw everyone is saying the same thing. Why Dexter why. I totally hate the way they handled things with Debra Morgan. Bad way to kill her character, of course i didn’t wanted her to die but if they had to kill her …Dude! Throwing her in sea? What’s got into you Dexter? Dark Passenger or Dumb Passenger? I get the whole idea of not letting your sister suffer, but couldn’t you just take out the ventilator system and leave Deb there? 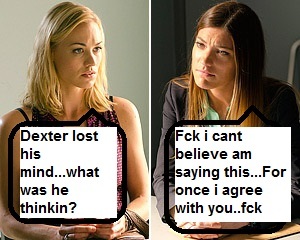 I mean What the F…I was totally disappointed with the ending of Prison Break but what Dexter did is super sad. Two most extraordinary shows ended in most sloppy ways. Totally crazy. Good Apples, Bad Apples & a Grape…!!!! Sometimes i wonder about the singer behind a beautiful sad song…wondering if the heart and voice behind the song is sad too? Anyhow, its Friday here and so i have something awesome to share. 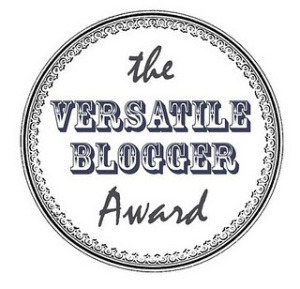 I have been nominated for Versatile Blogger Award by Make Somethings Monday. 1. Add to award certificate on your blog. 3. Nominate 15 deserving bloggers with the award. Now i wouldn’t be awarding nominees in any order and would like to dedicate and send it to each one of you. 1 – My favorite fictional character has to be Kathleen Kelly. 2 – I truly believe i would cease to exist if somebody took away music from me. 3 – I want to learn “moon walk”, just cant get it right. 4 – Im very emotional about dogs. Seeing a sad dog or one in pain kills me. 5 – I call my day of freedom from blues as “Dawn”, which i would like to believe is not a myth. 6 – I think my mom is Awesome but i never tell her. 7 – I cant watch Eight Below, Hachiko, Courage Under Fire, The boy in the stripped pyjamas again…specially the first two movies. I love them, i just cant get to the end without crying.